tl;dr: With AdaptivePosit, students who were significantly behind at the start of the unit, scored on average the same as their peers at the end. PlayPosit is currently working on AdaptivePosit, an NSF-funded platform to deliver adaptive interactive video content. These are preliminary results for one class. If you're a teacher or school administrator and would be interested in participating in the study, please email Seijin at playposit.org. Mr. Butcher is a 7th grade instructor of science in Los Angeles Unified School District. He’s a first year instructor who has just started using PlayPosit to leverage student achievement in his classroom. General student aptitude was determined by Mr. Butcher in an interview after the lesson was delivered. There were 4 students with high general aptitude, 18 medium, and 12 low. 1 week of implementation in four 52-minute classes and one 39-minute class. The class completed the pre-diagnostic, 3 lessons, and the post-diagnostic. Students were randomly separated into three groups: (1) Interactive Adaptive, (2) Interactive, and (3) Non-interactive. Interactive Adaptive students were taken down an adaptive content course which adjusted the language used to explain scientific principles into more simple or complex terms. This was based on the student’s performance answering PlayPosit questions. Students who did well were taken down a track that delved deeper into principles, and students who did not perform as well were taken down a track that used simpler language to break content down into its fundamental principles and concepts. Interactive students were taken down a track with PlayPosit’s interactive content without adaptivity, and Non-interactive students were taken down a track with no interaction and no adaptivity; they only watched video content. The small sample size resulted in an uneven distribution of performance on the pre-test diagnostic (Table 1). Consistent across all aptitude levels, Adaptive students made the largest net gain in points. Non-interactive students made the smallest. 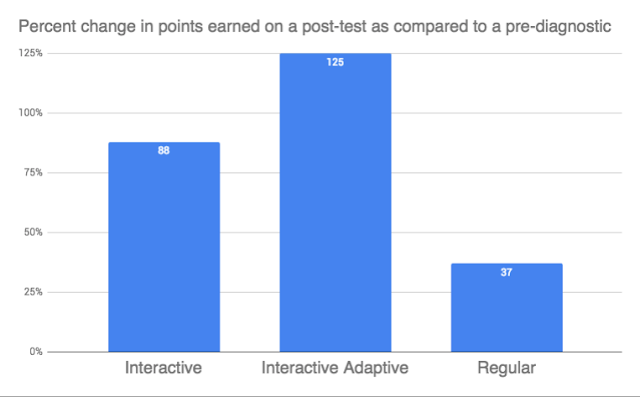 Students who took the adaptive content more than doubled their post-diagnostic scores, and scored 25% higher than Interactive students. The end result was that students who were significantly behind at the start of the unit, scored on average the same as their peers at the end. Special education status and score differences with peers were negligible, suggesting that the content could be used by all groups of students. Our initial findings indicate that AdaptivePosit has an overwhelmingly positive effect on classrooms, but we need more data to verify this! We would love to partner with you, and instructors at your school for a focus group in the next month. If selected, we’ll fly out to facilitate this program with you over the course of a couple days. Please contact us at Seijin at playposit.org and we’ll reach out! Adaptive students on average scored the lowest in the pre-diagnostic, but caught up to peers in the post-diagnostic. High level students continued to score highest scores, outpacing the rest of their peers. Medium level students made an incremental gain. Low level students more than doubled their initial scores, and ended almost on par with their medium level peers. There was a negligible difference between students who were classified as special education students, and their peers.